A few days ago I officially took my obsession with beer to a new level. 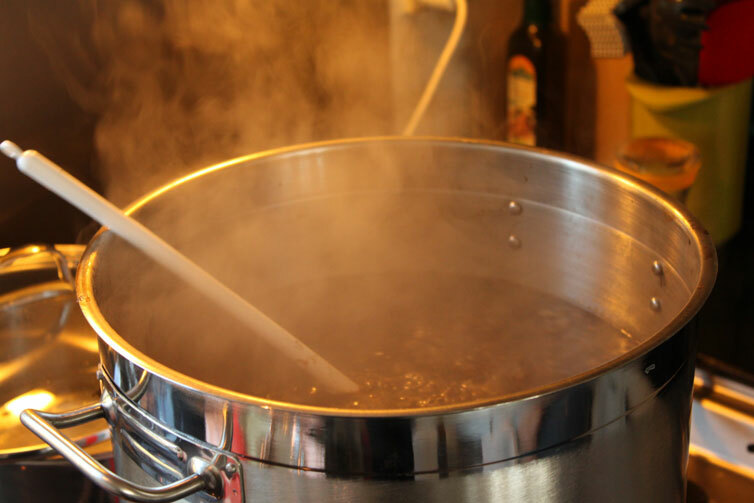 I decided that if I liked beer so much why not brew my own.So here is the article on my first homebrew day. The beer is an Irish stout, one of my favorite types, I am calling it "Schemer's Stout". My kit came with some specialty crushed dark grains. I steeped them for 30 minutes in a few liters of water before straining it over to the primary boil pot to really get started. Spent a lot of time writing out instructions and time schedules, and preparing everything, that is one thing just about all the brewing guides agreed on. Started my yeast up in a jar to make sure it was still alive after all the shipping. After topping my primary boil kettle off with 8 more liters of water and added 3 kilos of pale malt extract. Brought the whole thing to a boil and added the majority of the hops, reserving a small amount for the last five minutes of boiling. We bought an apartment recently. I agreed on this one primarily because it had a bathtub I could use as a wort chiller! (oh and because it is a nice apartment) So I submerged the boil pot in cold water and brought it down to about 30 degrees C. After pouring the beer through a sieve into the primary fermenter bucket I pitched the yeast, sealed it up, and waited for the magic to happen.